1. 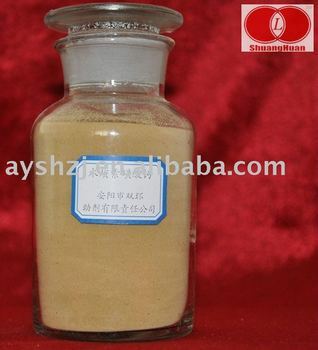 The use level of product is 0.20-0.30% of cement dosage, common dosage of 0.25%, reducing the water rates up to 8-12%. 2. Does not change dosage the water , it can increase the mobility of concrete to improve workability. 3. While maintaining concrete slump, with the same intensity and the reference concrete, can save 8-10% of cement. 4. calcium lignosulphonate superplasticizer with micro-cited gas can increase the impermeability of concrete freeze-thaw performance. 5. This product is not corrosive to the steel reinforcement and aggregate. This product is suitable for large volume concrete, high fluidity concrete, pumping concrete, commercial concrete, and concrete construction in summer, and there are special requirements for slow setting concrete, piles of concrete, Shen pile of concrete, hand-dug hole large volume of concrete and underground concrete construction, generally with the use of superplasticizer compound. 5,Innocuity , non-inflammable , non-explosive. Anyang Double Circle Auxiliary Co., Ltd.